Rickey and his strangely quite cousin Angela arrives at Camp Arawak to spend the summer. Soon after their arrival, a series of murders disturbs the all camp. Sleepaway Camp is of the first movies that comes to mind when the sub-genre of eighties slashers is brought up. The film is the epitome of a slasher film in so many ways, for example the time period’s campy atmosphere, cheesy teenage dialogue, point of view from an unknown killer, and a twist ending when the killer is finally revealed. 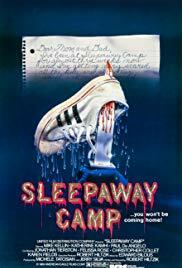 What makes Sleepaway Camp special is that it’s also different from other slashers because of its large mix and complexity of characters, its entertaining filler scenes and its fearless filmmaking. The ending comes to shock to anyone who doesn’t know about the twist prior to watching the film. Its final scene is so notorious that it fits in the same category with the likes of Saw and The Sixth Sense. Sleepaway Camp without question ranks as one of the top 80’s slasher films, and probably doesn’t get the credit it deserves.